Fall has always been my favorite time of year. For those of us who have been on the academic calendar our entire lives it’s just as much a season of rebirth and new beginnings as the spring. Keeneland, funnel cakes, football–there’s a lot to love in the few days between the first time you need a jacket and the first Christmas commercial. Part of it is that the traditional fall flavors are some of my favorites. Ovens get turned back on and roast things to a golden brown, baking spices show up everywhere, and the summer fling with clear liquors comes to an end and bourbon makes us wonder why we ever strayed. As a beer lover it brings two of my favorite seasonal beer traditions–ludicrously large mugs of malty Oktoberfest lagers, and the onslaught of pumpkin beers. I know what you’re saying–“Jonathan, you magnificent stallion, you’re a beer snob, right? Doesn’t that mean you scoff at pumpkin beers as gimmicky distractions from worthwhile beers, which are all hop-bomb IPAs?” Yeah, I know, and I really don’t get it. Pumpkin beers are tasty, dammit. And it’s not like pumpkin beers are some kind of new fad; pumpkin was a common addition to beers in the American colonial days when quality malt wasn’t always available. 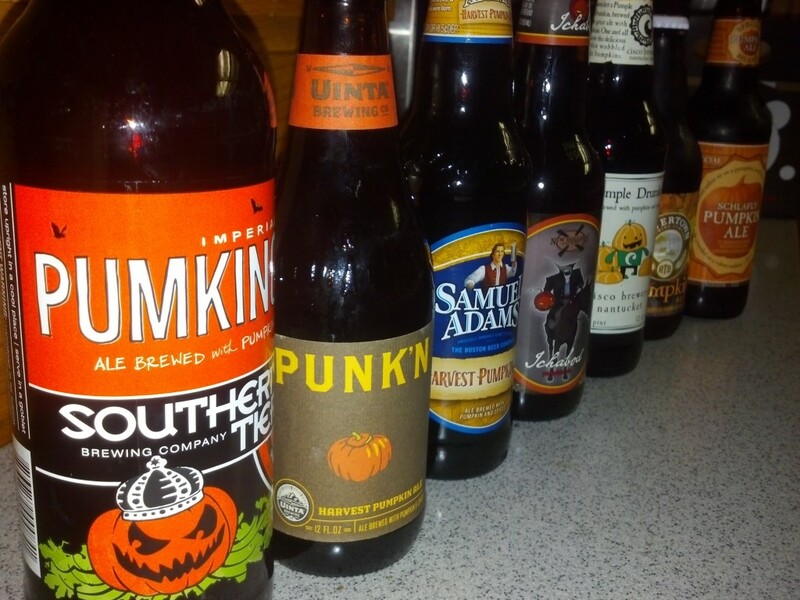 Since there is a dizzying array of pumpkin beers out there, we at What’s Cookin’ Now! have decided to do a public service and try as many pumpkin beers as we can so you don’t have to waste your time with the losers. We picked up a mixed 6-pack plus one at Liquor Barn in Lexington. These are all fairly traditional pumpkin beers–mostly medium brown ales infused with pumpkin and/or pumpkin spices (though interesting variants like Southern Tier’s Warlock are absolutely worth checking out). Tamara (a huge pumpkin beer fan) and I were looking for a pronounced pumpkin flavor; “pumpkin spices” are welcome but shouldn’t be the focus, because despite what food manufacturers might want you to think pumpkins don’t come out of the ground tasting like cinnamon. We agreed that this batch had two clear winners, two clear losers, and some in the middle of the pack. Here they are, from worst to first. (1/5) The two beers we didn’t like very much were alike in that they had some pumpkin flavor but were out of balance. Cisco’s Pumple Drumpkin came off more as bitter than hoppy, which might have been fine as an undertone but was really up front. If anything, pumpkin was the undertone, which isn’t what we were looking for here. Pumpkin beers don’t have to be sweet–it’s better when they don’t really come off that way–but a little sweetness brings out the pumpkin flavor, and bitterness tends to hide it. Minor points because “Pumple Drumkin” is fun to say. (1/5) This one missed the mark in the same direction as the Pumple Drumkin. Its hop profile was more floral than bitter, but it still moved the pumpkin to the back seat. A little spice came through as well, but still not enough to really stand out. We will give this one credit for having the best bottle of the bunch. (2/5) This one was also on the dry and bitter side, but not nearly so much as the first two. The pumpkin came through a bit more. Not bad, but not exciting. (2/5) With a good balance sweetness and bitterness and some nice malt, this one had everything we were looking for in a pumpkin beer except for one thing–the pumpkin. I’m not sure I would have even called this a pumpkin beer if I were tasting it blind. No pumpkin spice, either. It’s a very good beer, as all of Rivertown’s are, but they tried to go subtle with the pumpkin and ended up missing completely. (4/5) Like most Sam Adams beers, this is a very good example of what it’s trying to be without quite being spectacular. It has lots of malt up front, and lots of pumpkin and spice pick up later. A very solid choice. (5/5) Here’s another beer that was dry and crisp and a little bit bitter, but in a good way this time because the pumpkin is the star. We got more canned than raw or roasted pumpkin from this, but the fact that we could tell the difference even with so much flavor on top is remarkable (and there’s nothing wrong with canned pumpkin, IMO). A complex beer that’s unquestionably a pumpkin beer. Definitely one of our two favorites. (5/5) This is it, the beer we talk about when we talk about pumpkin beer. It’s malty and a bit sweet with just a little spice and lots of raw pumpkin flavor (punched up by the addition of butternut squash, a common ingredient in good pumpkin pie). In fact, “good pumpkin pie” is what we wrote down–the real kind made by a skilled hand who knows how to make the flavor of the gourd come through. More to come as we find and taste them. Agreed on Pumking. That’s one of my yearly favorites. Schlafly as well. I also liked Kentucky Ale’s Pumpkin Barrel Ale, but I think it’s a distant third for me. I had several pumpkin wheat beers, and though I’m usually a huge fan of wheat beers, it just didn’t work with pumpkin.